Who benefits most from these mid-range high performance blenders for smoothies? Or just enjoy a faster and smoother blending process. Why Not A Regular Blender? I won’t say it’s impossible to make a great smoothie using a basic low-tech blender, but after awhile you will notice that your smoothie making experience could be better. If you’re really getting serious about making smoothies, especially green smoothies or vegetable smoothies, you’ll find that the standard blender just doesn’t cut it. Possible? Yes. Ideal? Not exactly. 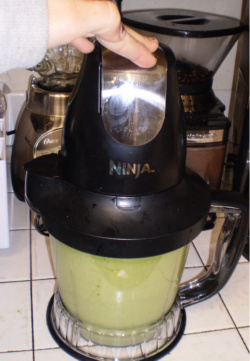 Last winter I finally started using the Ninja blender, and it made a HUGE difference in my smoothie blending process. Instead of having to blend in phases, I could just toss everything in at once, blend and be done in less than a minute. Plus there are certain ingredients that just don’t blend as thoroughly on the Oster blenders, if at all. I actually used the “Ninja Master Prep Professional Blender, Chopper and Ice Crusher,” which is actually not that much more expensive than the Oster blenders listed on the previous page. The Ninja brand also makes a variety of pro blenders which look awesome but I have not tried them yet. To get an idea of just how much more powerful this blender is, the Ninja Pro has 1000 watts versus the Oster which has only a 450 watt motor. That means it’s over twice as powerful. If you’re already making your own smoothies, can you imagine how much better the process would be if your motor were twice as powerful? Is The Ninja Right For You? The Ninja Blender may be twice as powerful as the Oster, but it is also about twice the price...so keep in mind your own budgetary needs. If you’re just getting started and can’t afford the Ninja, start with a regular blender and put this or one of the other high-powered blenders on your Wish List. Get used to the process of making smoothies with a basic starter blender, and start saving up for a better blender. On the other hand, if you are just getting started and CAN afford it, it certainly can’t hurt to start with a better blender. If you don’t own a blender yet, why go out and buy one that’s cheaper and lower quality only to upgrade later? Save resources by starting out with a higher quality smoothie blender, if your budget allows it. For me the Ninja worked really well, as it allowed me to add more ingredients and end up with a nice, smooth, drinkable texture. The Ninja is only one option for mid-range high performance blenders for smoothies, one that I have personally used and enjoyed. The Health Master is another option, one of those “As Seen On TV” options that actually works. Health Master has a slightly higher price than the Ninja (or with some of the models, significantly higher), but it also has higher wattage (i.e. more power) and higher performance. It’s another mid-range option, in between the standard department store models and the high-end models like Vita Mix. I’ve never tried the Health Master, but my endurance athlete friend swears by this blender for his superfood smoothie recipes for runners and athletes. For proof that this blender works, consider this: he runs 20+ miles on an average day, sets records on mountain race courses, and goes trekking in the Himalayans….and this is the blender he uses to fuel all of that. Enough said? 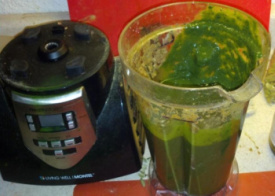 Click here to read his review and “world famous” superfood breakfast smoothie using this blender. Click here to buy the Health Master blender on Amazon. These are some incredible mid-range options and a perfect mix of great quality with a somewhat affordable price. But maybe you’re looking for the absolute best blenders for smoothies overall, regardless of price? Hey, if you’re considering investing in a heavy duty blender, it does make sense to consider all your options. After all, if you’re going to invest, you might as well weigh your options and make the best possible investment for your needs. Click here to learn more about high performance blenders including the fanciest high-range options…the absolute best smoothie blenders around. Do you own one of the blenders mentioned on this page, or any other smoothie blender? Click here to leave a review and read blender comparison reviews that others have written. Joyofsmoothies.com is a participant in the Amazon Services LLC Associates Program, an affiliate advertising program designed to provide a means for sites to earn advertising fees by advertising and linking to amazon.com.